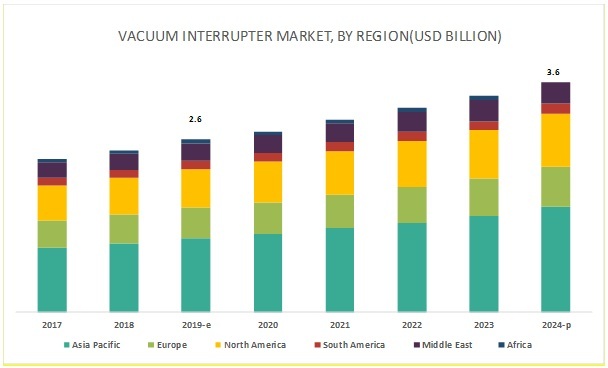 [162 Pages Report] The global vacuum interrupter market is projected to reach USD 3.6 billion by 2024 from an estimated USD 2.6 billion in 2019, at a CAGR of 6.49% during the forecast period. This growth can be attributed to factors such as upgradation and modernization of aging infrastructure for safe and secure electrical distribution systems, expansion of transmission & distribution networks, and increasing rate of industrialization and urbanization. The circuit breaker segment, by application, is estimated to be the largest market, at a CAGR of 7.91% during the forecast period. The recloser segment is expected to be the fastest growing segment during the forecast period, at a CAGR of 8.72% during the forecast period. Positive economic outlook and growing manufacturing industries in developing countries, infrastructure development, and urbanization are the major factors driving the growth of the circuit breaker segment. Consecutively, effective transmission & distribution channels and refurbishment of the existing distribution networks with modernized protective devices demand the use of reclosers to protect the distribution networks. Consequently, with the increase in the installation of reclosers and such equipment, the vacuum interrupter market is expected to be boosted in the forecast period. The utilities segment is expected to hold the largest market share and be the fastest growing segment during the forecast period. It primarily covers industries oriented toward power generation and transmission & distribution process. The advent of new electrical gadgets and the endless need for electricity and utility services are driving this segment in the forecast period. 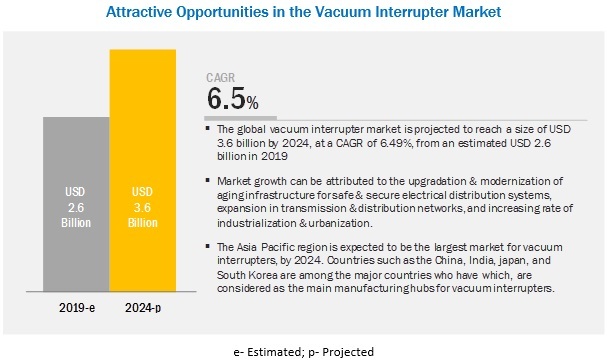 The Asia Pacific region is projected to be the largest vacuum interrupter market by 2024. Countries such as China, India, Japan, and South Korea are among the major countries considered as the main manufacturing hub for vacuum interrupters. Over the past few years, this region has witnessed rapid economic development. According to a 2017 report by the World Economic and Financial Surveys, the growth momentum in the largest economies in Asia Pacific is expected to remain quite strong, reflecting the policy stimulus in China and Japan, which, in turn, is benefiting other economies in Asia. The rapid increase in economic growth would lead to an increase in the demand for power. This would necessitate greater investments in the power generation infrastructure. Additionally, the rise in investments in smart grid technologies, which include distribution grid automation, smart meters, and demand response systems in countries such as Japan, South Korea, and Australia, would create growth opportunities for the vacuum interrupter market in the forecast period. In September 2018, ABB supplied High-Voltage Direct Current (HVDC) converter stations in Tajikistan and Pakistan. The project was a part of a World Bank supported order to be executed as a consortium project with Spanish Engineering, Procurement, Construction (EPC) company, Cobra. Cobra was responsible for the construction and installation of the associated substations. In September 2018, Siemens AG started its manufacturing unit in Queensland, Australia to cater to the growing global demand for Fusesaver. Fusesaver is a product that helps in eliminating up to 80% of the sustained electricity outages in rural power networks. In February 2018, Mitsubishi Corporation completed the construction of an integrated automation factory with the e-F@ctory concept. The factory produced products such as vacuum interrupters and circuit breakers by deploying the integrated automation, which is based on IoT technologies for achieving high efficiency, productivity, and minimizing cost. In January 2018, under the 'Make in India' initiative, ABB opened a factory in Nashik (India) for manufacturing power distribution products. The products exported by the factory are outdoor products for substations such as tank circuit breaker, auto reclosers, and gas-insulated switchgear. In March 2019, Eaton partnered with Electric Power Research Institute to provide new energy management, smart, and secure circuit breakers for generation energy grid. The report would help the key players understand the strategies of their competitors better and help them in making better strategic decisions. The report addresses the market share analysis of the key players in the vacuum interrupter market, and with the help of the strategies adopted by these companies, one can successfully enhance their revenues in the respective market. The report provides insights about the emerging geographies for vacuum interrupters, and the entire market ecosystem can gain competitive advantage from such insights. 11.6 Shaanxi Baoguang Vacuum Electric Device Co. Ltd.
11.11 Wuhan Feite Electric Co., Ltd.
11.12 Chengdu Xuguang Electronics Co., Ltd.
11.13 Shaanzi Joyelectric International Co., Ltd. This study involved 4 major activities in estimating the current market size of the vacuum interrupter market. Exhaustive secondary research was done to collect information on the market, the peer market, and the parent market. The next step was to validate these findings, assumptions, and market sizing with industry experts across the value chain through rigorous primary research. Both top-down and bottom-up approaches were used to estimate the total market size. Thereafter, the market breakdown and data triangulation technique was undertaken to estimate the market size of the segments and corresponding subsegments. This research study involved the use of extensive secondary sources, directories, and databases such as T&D World, Bloomberg Business Week, Factiva, and, world oil and gas journal, to identify and collect information useful for a technical, market oriented, and commercial study of the vacuum interrupter market. The other secondary sources included annual reports, press releases & investor presentations of companies, white papers, certified publications, articles by recognized authors, manufacturer associations, trade directories, and databases. The key players in the industry and market have been identified through extensive secondary research, and their market share in the respective regions have been determined through both primary and secondary research. After arriving at the overall market size—using the market size estimation processes as explained above—the market was split into several segments and subsegments. To complete the overall market engineering process and arrive at the exact statistics of each market segment and subsegment, the data triangulation and market breakdown procedures were employed, wherever applicable. The data was triangulated by studying various factors and trends from both the demand and supply sides in utilities, oil and gas, mining, transportation, and other sectors. This research report categorizes the vacuum interrupter market based on end-user, application, rated voltage, and region.